This is a very beautiful blanket! It's so soft and cozy and exactly what I was looking for. My only issue is that the color is very different than what is pictured. The picture appears to be very charcoal gray and mine arrived almost a dark lavender like the other reviewer mentioned, definitely on the more blue, almost mauve tones. It still worked for my space but wanted to provide feedback. 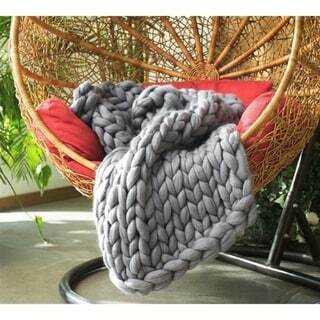 Madison Park Chunky Knit Throw - 50x60"
The Byourbed Pure Australian Chunky Knit Woolen Blanket is the definiton of luxury. Made of a pure Australian wool construction with a knit texture for added complexity, this blanket is the perfect addition to any room. Plus the Alloy color makes for neutral home decor, making it an easy element to add to your home. Comfort Proof Tested Results: 1983.6 GSM - 100% Wool. Dimensions: Throw Size: 40" x 60", Oversized Bedding: 80" x 90"
It's not possible to beat this blanket for looks. It is also warm & soft. Our only complaint, & this is really a matter of cost, is that the weave isn't very tight. Obviously, if they were twisted more tightly, more wool would be required, which would cost more. It mainly serves as a decorative piece in our living room. We do like it though. It is as 'chunky' as advertised. This grey wool rug is a stunner. I love the thickness and it is so luxurious. We have only used to a few times but it is a very beautiful accent! Super chunky and soft. Exactly what I wanted. So disappointed!! I couldn’t wIt to get this throw to complete my master bed, but sadly it’s NOT GREY, but a dark lavender! Have to return it but looking for something similar. All my orders have come in a timely manner and in good condition. It's everything I expected and more. Its soft and warm I will love this blanket for a long time and plan on buying another one for my daughter as a house warming gift. Really beautiful and sumptuous feeling. Treated myself but worried the entire purchasing and shipping process that I had over-splurged but it’s my birthday gift to myself! Exactly what it is that she wanted. "Does this shed at all? I saw one of relatively poor quality yet comparable price that left strands all over my sweater as I was trying it. Also strands pulled off very easily..."
This material has a tendency to shed. This blanket is not intended for heavy use, but rather for light decorative use. For the style, quality, & value. Amrapur Overseas Faux Fur Reverse To Flannel Throw - 50" x 60"